Learn to make your own backyard remedies! Ah..choo! Got a bug bite? Maybe just started a tickle in the throat? Or feeling like you are coming down with a fever? What can you do? More and more, individuals are beginning to choose natural products over chemical ones for their families and themselves to help them through the first signs of bodily dis-ease. 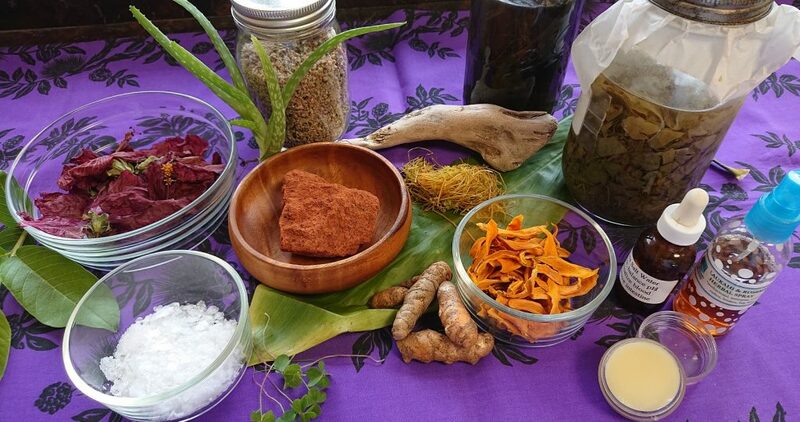 In this hands-on family-friendly exploratory workshop, you’ll learn how to take care of yourself with first-aid remedies from the Hawaiian and Filipino traditions. Through exploring Chaminade University’s backyard and your own neighborhood, you’ll explore the botany, pharmacology and medicinal uses of various plants. Before you leave you’ll make a take-home first-aid kit that will include tinctures, salves and a syrup. The workshop concludes with a cultural field experience where participants will be able to identify medicinal plant material in the wild themselves. Chaminade University of Honolulu’s sustainable campus la’au lapa’au—Hawaiian plant medicine workshops are based on the concept of each ahupua’a having enough natural resources to take care of its community. Dr. Eva Rose B. Washburn-Repollo is an associate professor of communications at Chaminade. During research trips to the Philippines, she studied the indigenous culture of the Philippines in the form of organic medicine, herbal healing and indigenous practices that are woven into their lifestyle. Dr. Malia D. Wong, OP is a senior lecturer of religious studies at Chaminade. A long-standing student of Kumu Levon Ohai of Kauai in the practice of la’au lapa’au (Hawaiian herbal medicine), she has conducted workshops in the Philippines and at Chaminade. During mission trips to other countries, she has helped stir the remembrance that all we need is provided by the Divine, most often found in our own backyard. On-campus housing is available for those who would like to stay at Chaminade for the duration of the program. Attendees will reside in the residence halls with gorgeous sweeping views of downtown Honolulu and Waikiki. Daily rates range from $70-100. There is also an additional $100 deposit and $50 cleaning fee. Linens can be provided for an additional $39. During the first part of the day, you’ll be introduced to the foundations of la’au lapa’au—Hawaiian plant medicine as practiced in the tradition of Kahuna La’au Lapa’au Levon Ohai of Kaua’i. Along the herbal walk, we’ll demonstrate and discuss plant botany, pharmacology and medicinal uses relevant to first aid. You’ll then be guided in making the first formulas of your first-aid kit: poultices and tinctures. In the morning you’ll be introduced to the qualities of various oils and be guided in preparing natural oils and salves to grow your first-aid kit. Next, you’ll be introduced to the rich herbal medicine tradition of the Philippines. Content of this portion of the study was facilitated through the Nursing Clinical Immersion Study Abroad program in the Philippines through partnerships with Silliman University Nursing Professor Rochie Cataylo. Preparations will include fresh medicine using plant and animal products with the production of a syrup. Get ready for a cultural excursion to apply your knowledge out in the wild, through herbal identification and application. This extended workshop is subject to cancellation due to low enrollment. Decisions on cancellations will be made no later than two weeks prior to the beginning of workshop. If this workshop is canceled due to low enrollment, a full refund will be issued.